I live in the southern Midwest and questionable Bible Belt territory, where Lipton iced tea with at least one cup of sugar per half-gallon reigns supreme. In fact, my parents had two pitchers that we regularly filled up with this sugary yet somehow still bitter liquid and they never, ever, let them run empty. So, needless to say, the first time someone offered me a cup of tea, I was hesitant. In fact, I downright refused loose leaf tea for years, thinking it would be similar to the atrocity of my childhood. I know, I know: Treachery. If you've only ever had packaged iced tea, the Money Draw Tea offers you a treat to your senses. This tea would easily make the smoothest transition between packaged tea and loose leaf. The Money Draw Tea could be your beginner "real" tea! Besides, who doesn't need a little money in their life anyway? 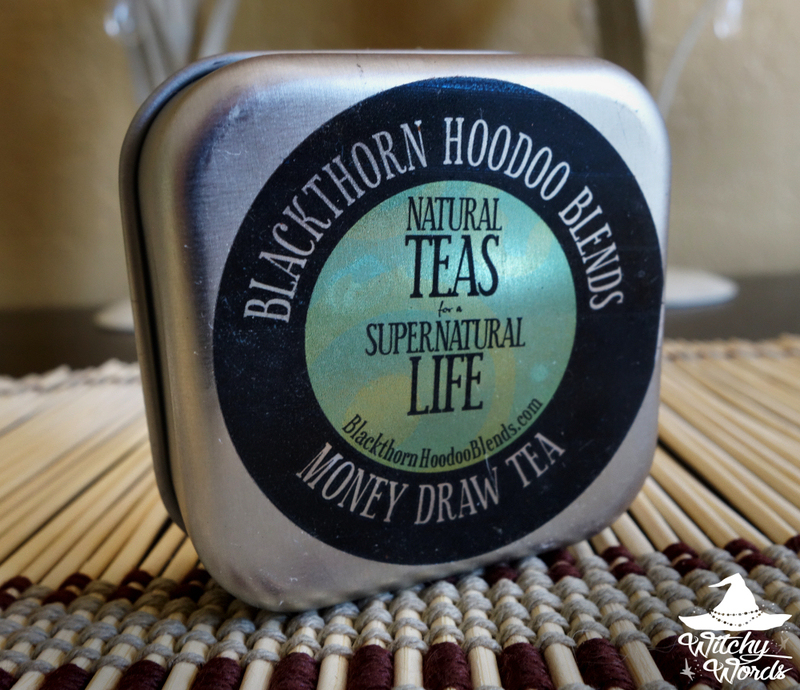 Blackthorn Hoodoo Blends specializes in ethically-sourced tea blends imbued with magickal purpose. Amy, the owner, has had six years of experience blending teas before opening her shop, and over 14 years of experience in teaching about herbs. And she truly knows what she's doing! What you'll find in her store isn't simply "Earl Grey" or "Rooibos" but combinations that are so unique, you simply can't find them anywhere else. On top of the amazing flavors, add charged herbs and oils that give your spiritual life a little boost and you have a unique pagan-owned business! I am positively honored that they're allowing me to review six different flavors of their teas for you, my Witchy readers! 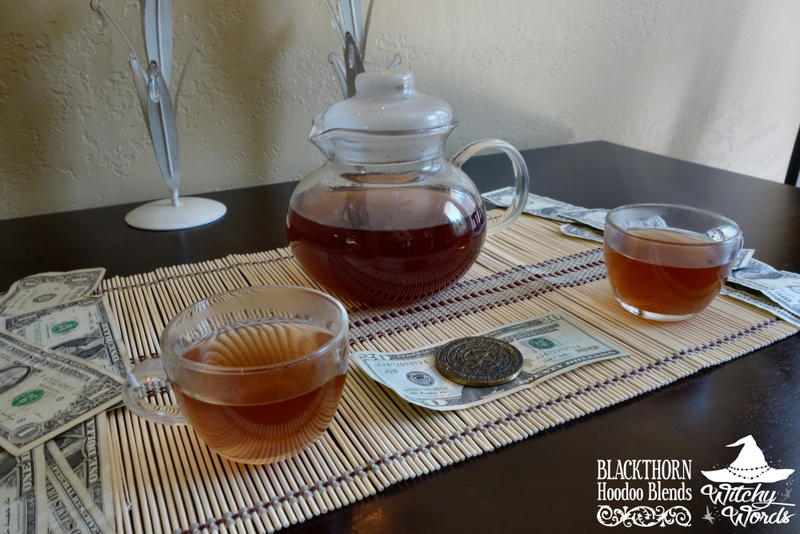 Today's tea review: The Money Draw Tea. 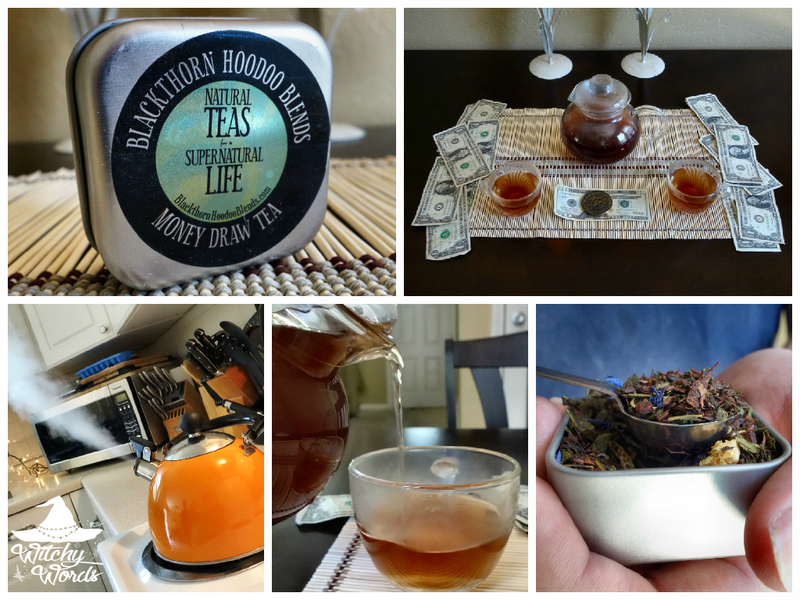 The website describes the Money Draw Tea as an "Earl Grey flavored Green tea and Rooibos blend." I'm familiar with all the different components, but trying to figure out a temperature, steep time and amount to steep was... interesting to say the least. Green teas should always be brewed at lower temperatures to enhance the flavor for between one and three minutes with about one tablespoon per 16 ounces. 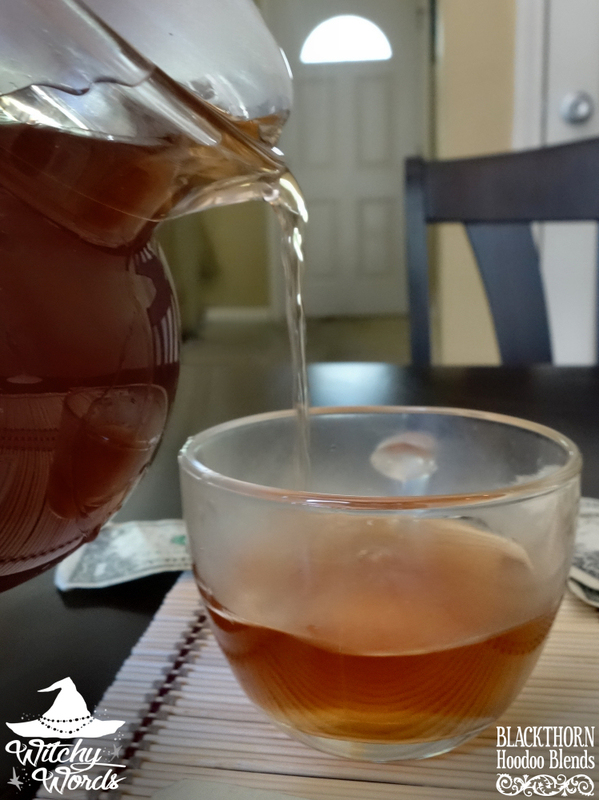 Rooibos, however, is a high heat extended brew - between 3 and 5 minutes - with one tablespoon per every eight ounces. Confusing, right? I erred on the side of caution and went with the lower brewing temperature and time of the green tea, but kept the amount of the Rooibos. Did I do it right? Who knows. Is there a right? Maybe. Probably. If I had one suggestion for BHB, it would be to put suggested amounts per 8 fl oz, temperatures and brewing times on their website. The first thing you're going to notice about this tea when you open it up is the amazing citrus aroma - my roommate and fellow Circle of Fountains member Tony associated it with, in a good way, Fruity Pebbles sans the chemicals. The amazing smell comes from the orange and bergamot in this tea, and is sweetened by the Rooibos and Honeybush. The flecks of beautiful indigo are the blue corn flowers which adds an aesthetic value to the loose leaf itself and a bit of texture to the final tea. Be sure to come to this tea with a clear nose and use your senses - smell is such an essential part of tea drinking! With this tea, avoid using a glass infuser. 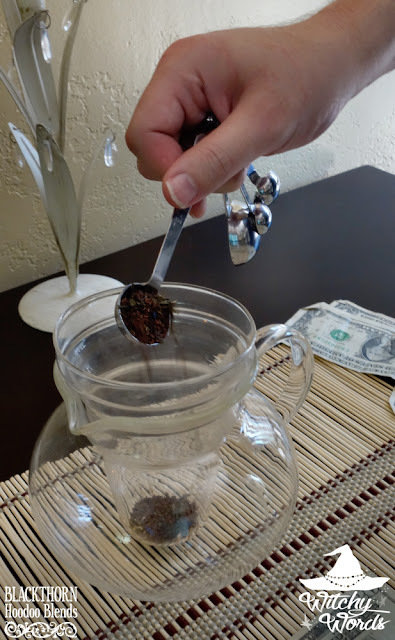 The large leaves in this tea are going to clog up your tiny little openings and cause quite a mess as you attempt to settle the infuser back into your pot of water. Even when you get it in there, you're going to have to do a lot of stirring to get it to infuse properly. If you should need to stir, remember that clockwise draws to you and counterclockwise banishes. For the Money Draw Tea, I don't think we'd want to banish money (nope, nope, nope) so clockwise it is. That being said, the smarter option would be to use a full pot tea ball or mesh strainer instead. I should have noted this before putting everything together and that's my mistake. However, use my mistake to your advantage with this tea! I can't complain about using the glass, as frustrating as it was. Look at that beautiful deep amber color! 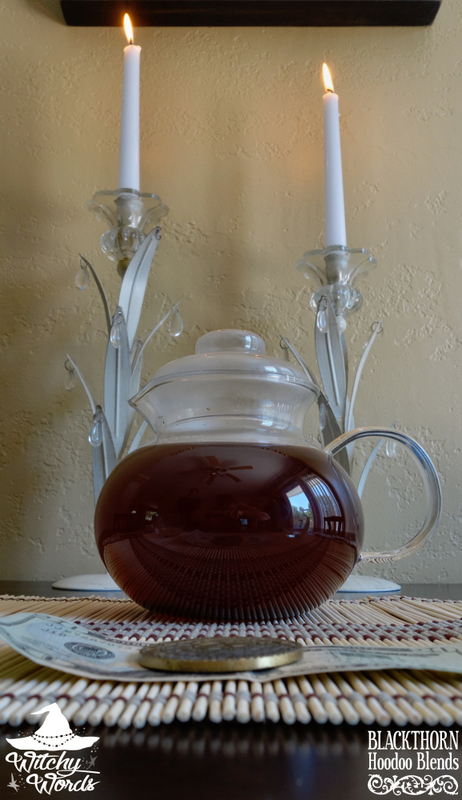 That amber is mostly colored by the Rooibos and Honeybush and darkened by the other elements of this tea. Watching a tea brew is probably one of my favorite parts of drinking. 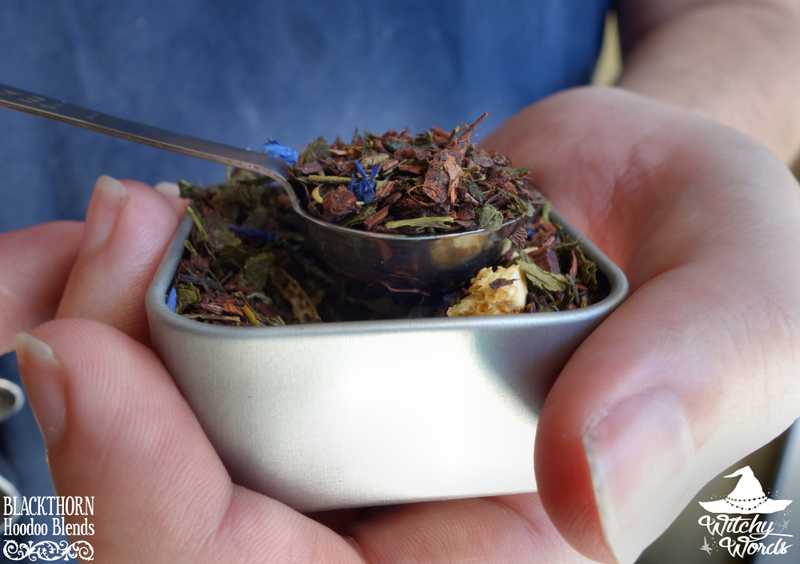 The beautiful colors you can get in a pot of loose leaf tea are unrivaled. That's why you so often see me use my glass teapot despite having about 10-15 more. ... It's an addiction, I know. But it's not a bad one. I'll take it. When your tea has fully brewed and you're ready to serve, you need nothing more than the tea itself. 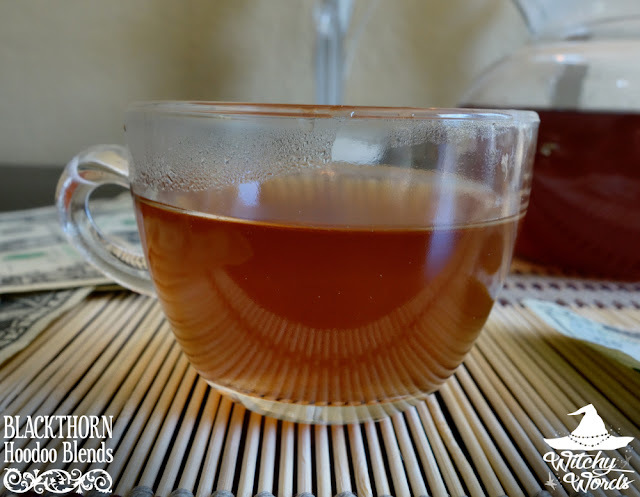 Because of its Rooibos and Honeybush blends, this tea is exquisitely sweet. No sugar and no honey needed! I think that's what makes this the perfect "starter tea" for someone who has never had loose leaf. When coming off of the sugar high that is southern sweet tea, most loose leafs are going to taste bitter to you. While adding honey can offset that perceived bitterness, it's better if you can taste a tea outright - at least the first time - so that you better understand the complexity of the flavors. 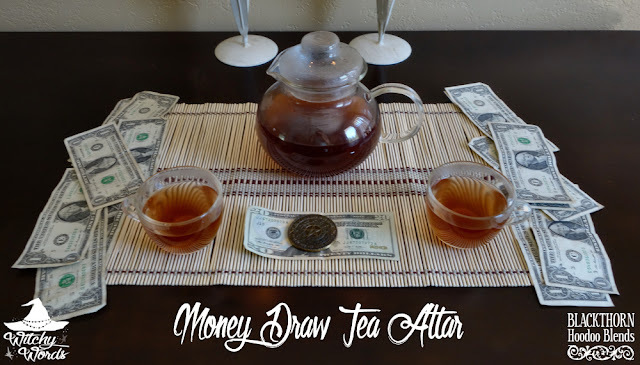 The Money Draw Tea offers a sweet-but-not-too-sweet flavor without the additions and could transition a new loose leaf drinker from sweet tea to Earl Grey in no time! This tea is incredibly easy to drink. It has a full, robust flavor with a strong sweet citrus note, yet carries the lightness of Green tea. The addition of vanilla makes it smooth on the way down. 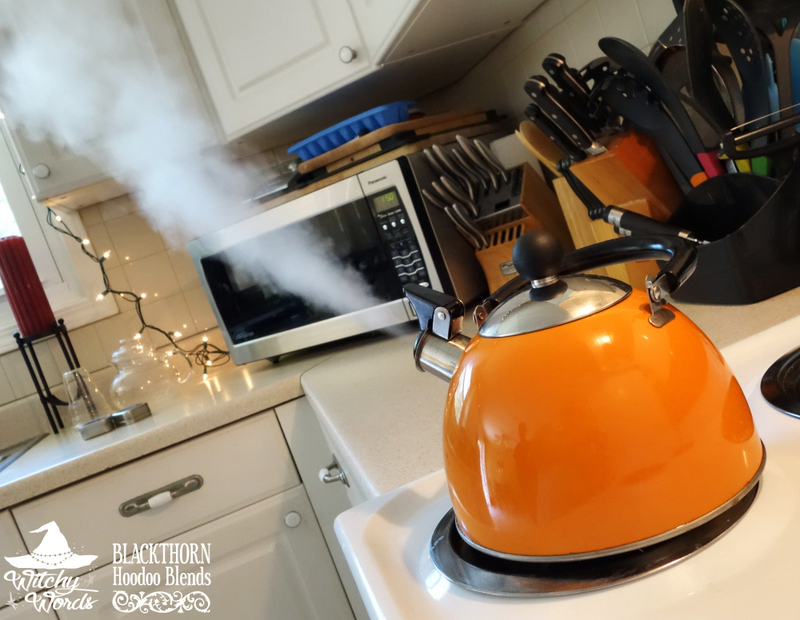 Because of just how flavorful this tea is, you'll find that the scent sticks with you after you brew a pot - in the empty cup, in the room, in the entire house. 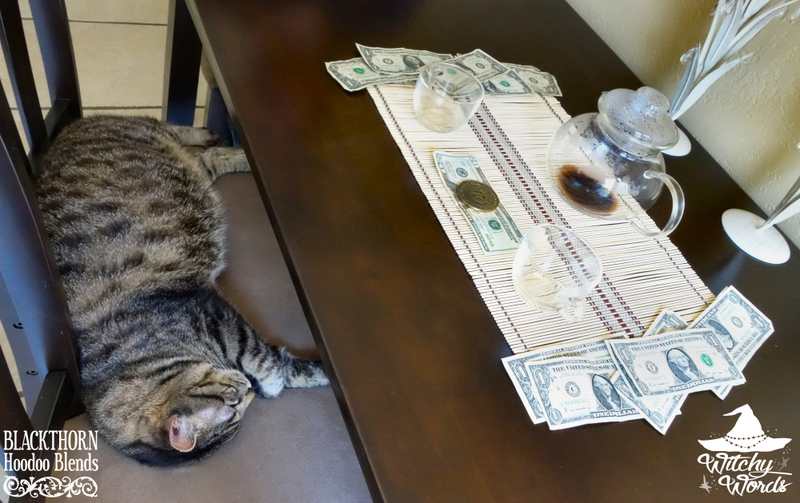 You're not soon to forget that you drank the Money Draw Tea, and really, would you want to? Tony and I both noted that this tea is easily in our top three teas ever, and is something that we plan to keep on hand when it runs out (in a few days, apparently). 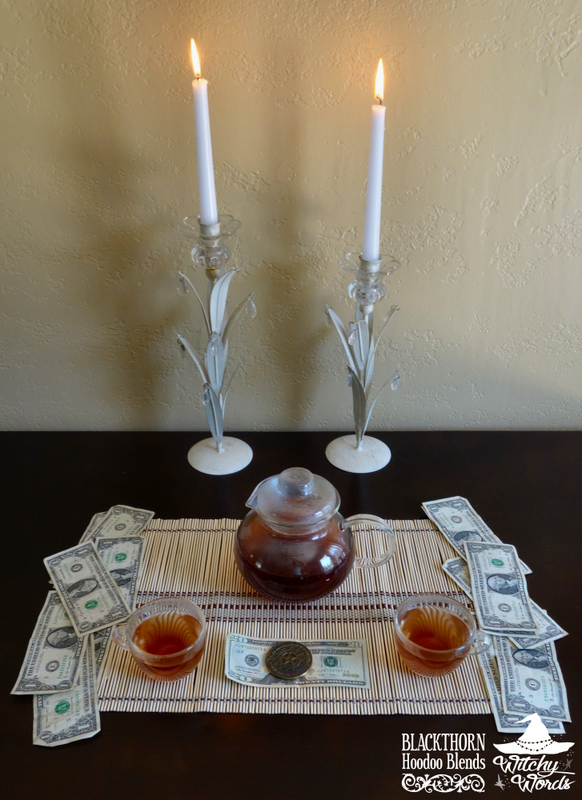 As for the tea altar, Tony and I went out of our way to hearken to the magickal properties of this tea. I used tips from caricature gigs to line the place mat and Tony brought in his altar coin for the center. We made it a point to sit across from each other and stay at the table for the entire duration of the pot, and even clinked our glasses on the last drink - both to our own personal monetary success and to the success of Blackthorn Hoodoo Blends for this amazing tea. Shortly after finishing this tea, I received two gig requests for the same day with just enough time in between that I could take both, so I can't complain! I think the Money Draw Tea did its job. So what do you do with your steeped leaves and left over bits in the bottom of your tea pot? The best part about loose leaf tea is that you can easily get at least two full pots out of the same leaves when reused. With as full bodied as this tea is, you could probably even get three. However, because we set up an altar and used this tea for magickal purposes, we decided to return the leaves to the earth. Once we were finished, I immediately took the pot and infuser outside to bury the leftovers. Overall, Tony and I were incredibly impressed by the Money Draw Tea and absolutely plan on adding this to our regular collection. 10 out of 10 would drink again. And again. And again. Marietta: "Since when did we become professional tea drinkers?" Tony: "We're not. We just referred to a tea as mature Fruity Pebbles."